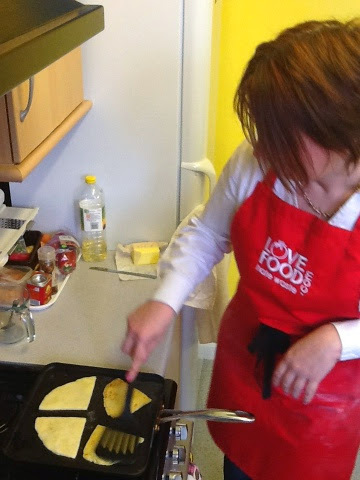 I was delighted to be asked by Aberdeen Forward to do a second Cookery Demonstration for them as part of their Love Food Hate Waste project. You can read about the first one we did here where I made Tuna Fishcakes, Cola Chicken and Layered Fruit Crunch. 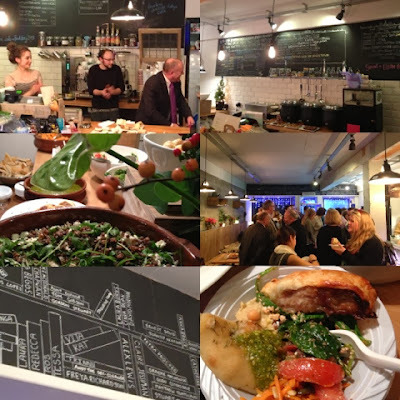 Different menu and different location this time round. 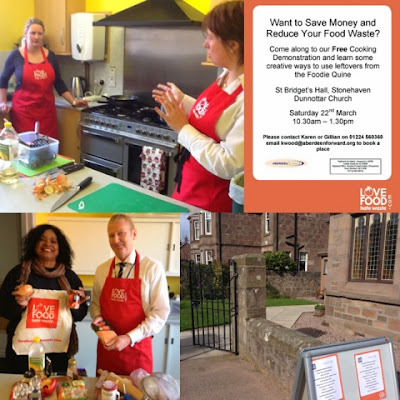 We were in Stonehaven as volunteers are being sought in the area to take part in a Zero Waste Scotland Fund Project where they weigh their food waste and record their recycling habits. Our three course meal kicked off with what I originally called "Bottom of the Fridge Soup". So named as it can be made from whatever veggies you have languishing there unloved and unused. I tend to do either a red or a green version and as such it has been re-branded to make it sound as appetising as it actually is. 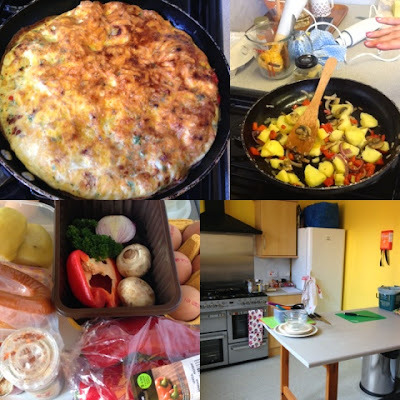 There are no specific quantities given in the recipes below for the soup or the frittata. The idea being that you use what you have available to you and modify as necessary. In a large pan sauté chopped onion and garlic in a splash of oil until soft. Chop the ‘bottom of the fridge’ veggies into chunks, add to the pan and sweat off for a few minutes. 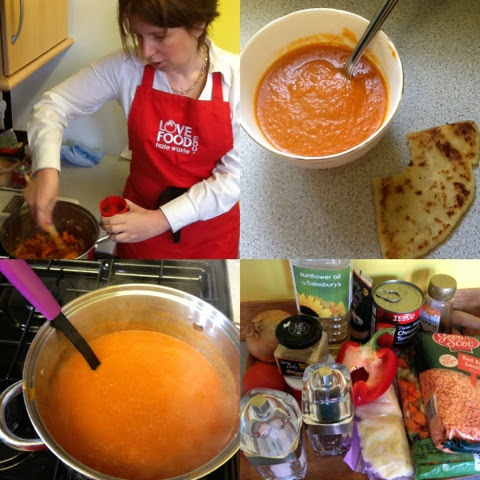 Add the tin of tomatoes, a litre or so of hot stock and a handful of red lentils and the seasonings. Bring to the boil then simmer for 20-30 minutes until all the veggies are soft. Blitz with a stick blender. Use whatever combination of veggies you have available to you. But be careful with strong flavours like green pepper. The addition of milk and/or cheese can be used to create a creamy soup. Be adventurous with your seasonings. Chilli, Corriander, Paprika, Cumin, Worcerstershire Sauce, Tobasco and many others all work well. Add a wee pinch of sugar (or honey) if the soup seems bitter. Sift in the flour and baking powder and mix until thoroughly combined. Heat a girdle or heavy frying pan. Once hot cook scones for about 3-4 mins on each side until golden brown. Raw veggies will require longer cooking than any leftover cooked ingredients which will just need warmed through. Season well and add herbs and spices as desired. Whisk the eggs together along with grated or crumbled cheese. Pour over the vegetable mix. The frittata can then be cooked purely on the hob, or popped in the oven (if frying pan is ovenproof) or finished off with extra cheese crisped under the grill. Slice into wedges and serve. Any leftovers are great served cold. The blacker the bananas the better for this recipe. Did you know you can freeze over ripe bananas to use in baking at a later date? Make a well in the dry ingredients and pour in banana and egg. Add milk until a dropping consistency is reached. Mix through a handful of choc chips. Spoon onto a buttered girdle or frying pan. Put in between a folded tea towel on a cooling rack to keep warm. A great turnout for the event with lots of good interaction and feedback from the group. 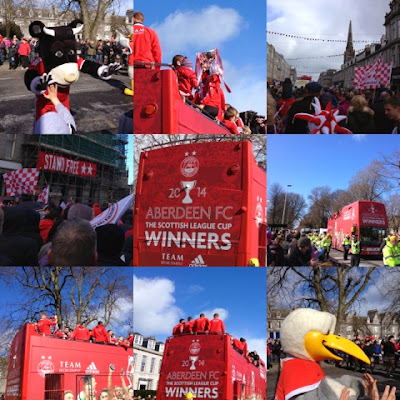 As a follow up Aberdeen Forward asked the participants what they had learned and what they would now do differently. Always good to get positive feedback and particularly heartening to see such positive actions being taken onboard. It was good to clarifying some of the items that I was unsure about freezing. Would happily attend another event. Didn't think of freezing bananas and often bin them - not any more. It's always lovely to get an invitation in your inbox. Especially when it involves meeting up with fellow bloggers, journalists and food enthusiasts over tastings, demos and lunch. The invite came from John and Kirsteen Sinclair, owners of Craigie's Farm Deli and Cafe in South Queensferry. I'd already briefly visited Craigie's on a recent trip to Edinburgh and been impressed with what I saw so decided to RSVP in the affirmative and take a road trip to the central belt to find out a bit more about everything that's 'growing' on at Craigie's. The weather was grim but the welcome was warm. A great group of bloggers, foodies and journalists were in attendance but it was particularly good to finally meet up with three who I've been chatting to for ages online but had never met in real life. Hilary from My Monkfish, Rachel from A Wee Pinch of Sugar and Wendy Inside Out Chef. Introductions made John told us a bit about the history of the farm before we were split into two groups for our tour. The Sinclair's have had tenancy of West Craige since the 60's when it operated as a dairy farm until pasteurisation regulations forced change to continue profitability. Fruit production began in the 80's along with a small informal farm shop. A barn was converted in the 90's to a larger shop open 6 months of the year. 2007 saw the opening of the new shop and cafe with capacity doubling in 2009 to include a Butchery. 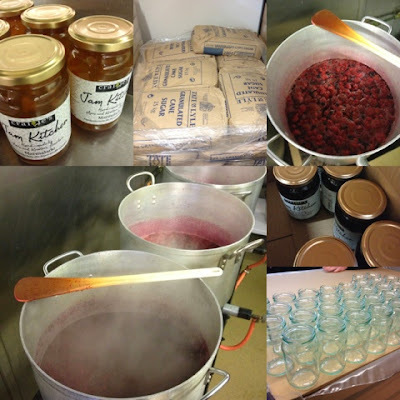 John's mother Anne heads up the Jam Kitchen where they produce a range of over 40 different jams, jellies, marmalades, chutneys and vinegars predominantly made from farm produce. The preserves are made in exactly the same method as you would use at home but on a bigger scale. Beetroot chutney and summer fruit jam was bubbling away during our visit ready to be poured into traditional 1lb jars. 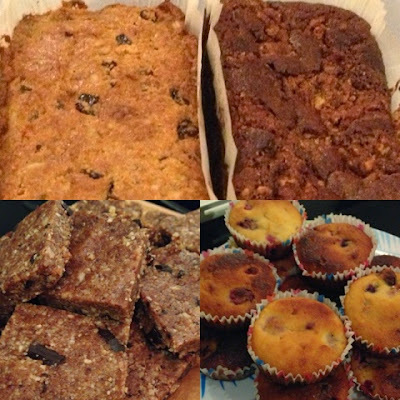 Next stop on our tour was the bakery where a fantastic looking and delicious tasting selection of homebakes for the cafe are made from scratch. 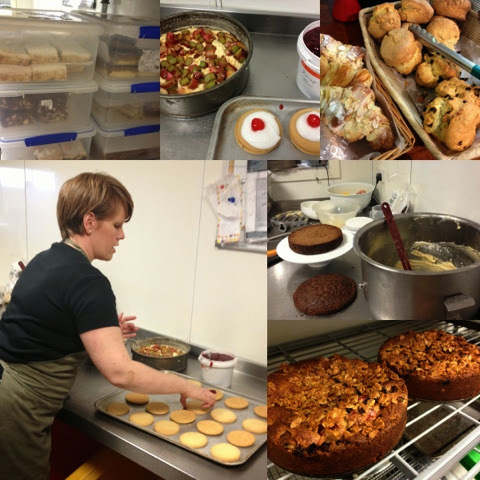 Empire Biscuits, Carrot Cake and Rhubarb & Orange Cake were in progress. Scones of all varieties and traybakes are also big sellers and a new 'Cake of the Week' puts in an appearance every Thursday. Tasting time and the opportunity to meet three of Craigie's suppliers. Our first port of call was Cairn O'Mohr wines hosted by Linzey. The Perthshire winery have been producing for almost 27 years. 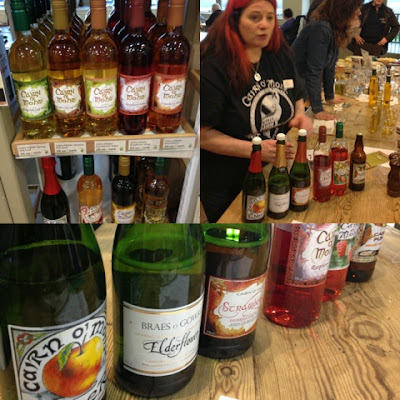 We tasted a selection of their fruity offerings encompassing Cider, Still and Sparkling Wine and non alcoholic Sparkling Elderflower. I'm definitely going to have to pay a visit to their visitor centre sometime soon. Meantime I impressed by sharing that I had a bottle of their Rhubarb Rhubarb in my wine rack and they we'd enjoyed their Bramble Wine and Autumn Oak Leaf wine at our Burns Celebrations. 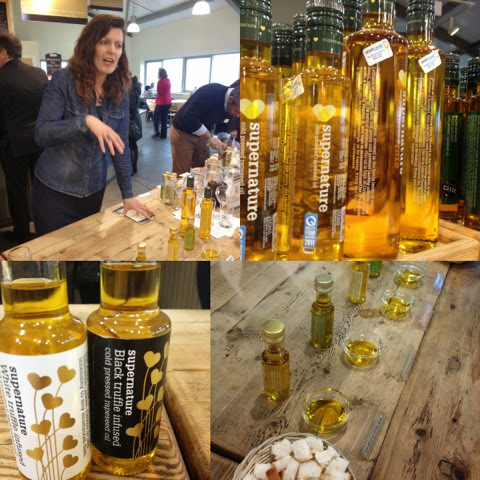 Lynn of Supernature Cold Pressed Rapeseed Oil was next at the tasting table. I'm a big fan of Scottish rapeseed oil for its health benefits, provenance and versatility. Supernature is light in colour and taste and works very well with infusions. An impressive range of 11 flavours with two more on the way. Whilst I loved both the Coriander and Lime I was very interested in the two newcomers. White Truffle and Black Truffle. I was lucky enough to get a sneaky sample of the White Truffle Infused oil home with me. Its flavour is intense and instantly transported me back to our Tuscan holiday. I shall definitely be seeking out more once my 100ml is gone. Last but by no means least was Tanny Gill, a man with an absolute passion for cheese. With an amazing back story culminating in 4 years on Mull making cheese. 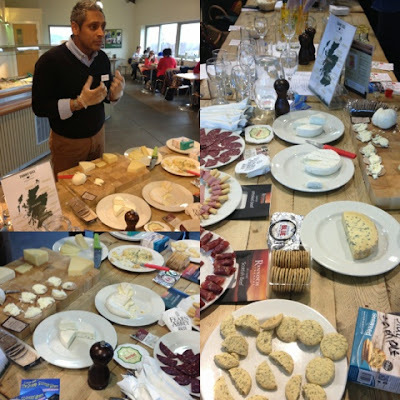 He gave us a whistle stop tour of Artisan Scottish cheeses including Paddy's Milestone, Jezebel, Arran Blue and Fearn Abbey Brie. These were accompanied with charcuterie from Great Glen Game and Rannoch Smokery. I could have quite happily foregone lunch and just devoured the remainder of the cheese. 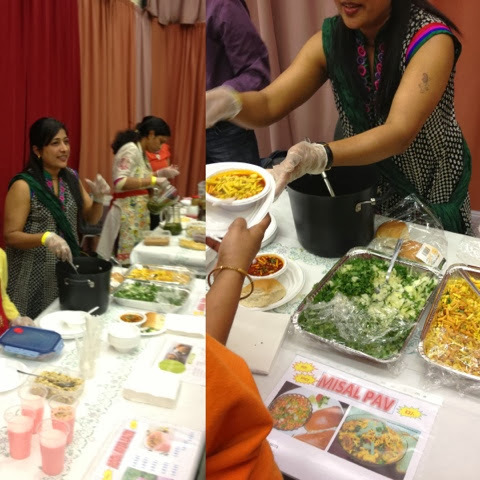 An amazing spread of meats, cheeses, quiche, frittata, salads, breads and chutneys filled the heaving table for our Foodies Lunch. 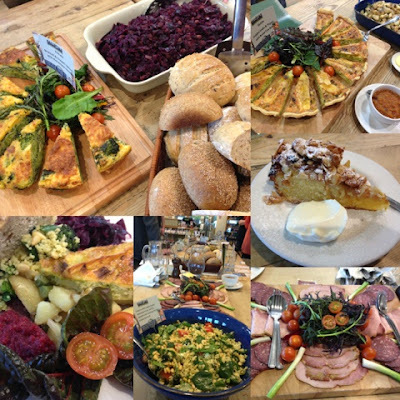 A real showcase of the food produced in the cafe and sold in the deli. Seasonal, local and absolutely delicious. We were absolutely stuffed and had completely forgotten about the promised Rhubarb and Orange Cake. There must definitely be a second stomach for pudding as we all managed it. Time for a wee browse round the deli to make some purchases before heading home beef olives, scotch eggs, rhubarb, seaweed oatcakes and piglet biscuits. 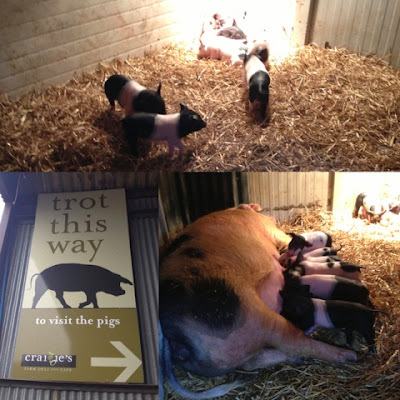 I'd told my daughter that there were newborn piglets at Craigie's and she asked me to take one home. Biscuit form was the best I could do. They were soooo cute. Possibly the favourite part of my visit. 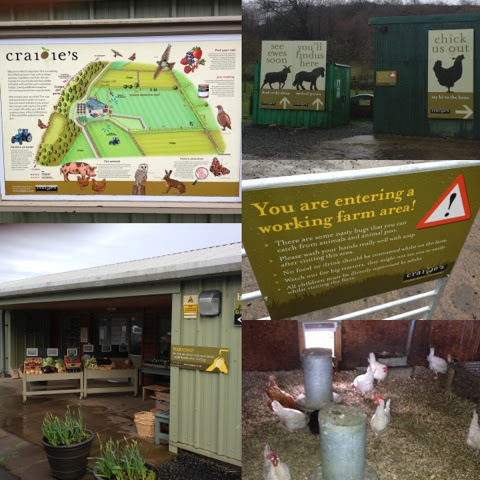 Thanks to Craigie's Farm, Deli & Cafe for inviting me and to Scene & Herd PR for hosting the event. A thoroughly enjoyable place to visit. Definitely one of Edinburgh's best kept secrets. Its been a long time since Aberdeen Football Club had anything to celebrate so a cup final clash against Inverness Caley Thistle has got Dons fans in a bit a a frenzy. 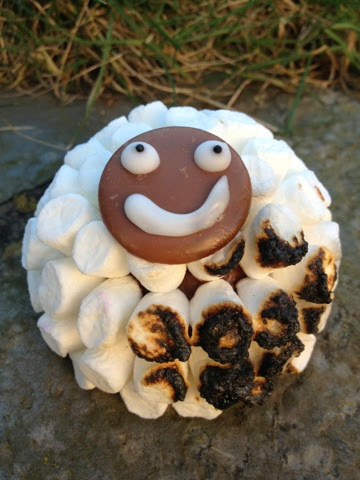 The sheep are indeed on fire. 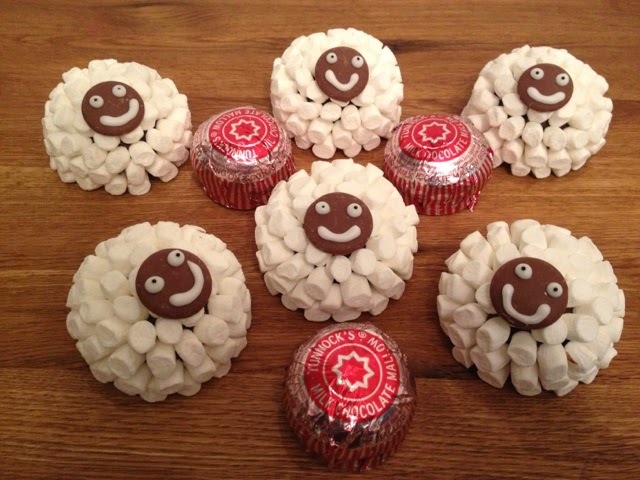 What better to mark the occasion than some Tunnock's Teacake woolly friends. If you don't understand the sheep connection unfortunately I am not in a position to clarify. 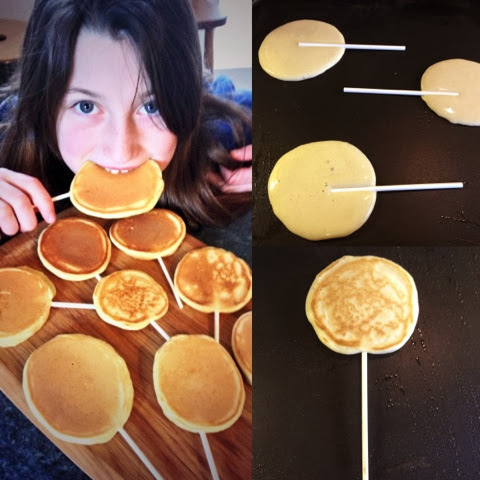 Lets just go with what Foodie Loon told the Bairns. 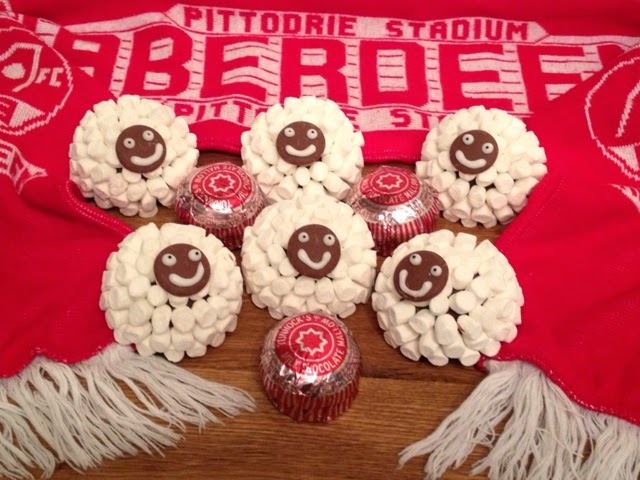 Aberdeen is a country team and there are a lot of sheep in the country. I could only get mini marshmallows in a mix of pink and white so the surplus will be need to be used for pink pigs, elephants or poodles. Or perhaps just eaten straight from the pack. 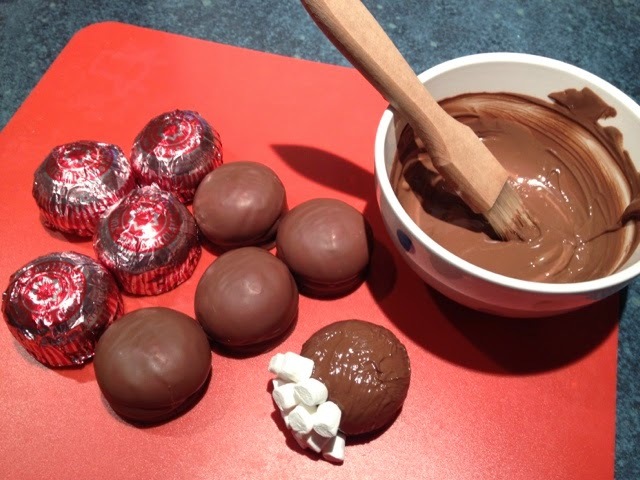 Melt your chocolate and brush it on to completely cover the teacake. Stick on the mini marshmallows in a single layer all the way round the bottom of the teacake. 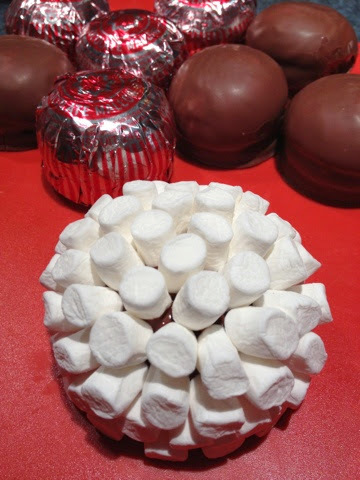 Continue in layers until the whole teacake is covered. Pop your sheep body in the fridge to set. Make up icing, melt white chocolate or use ready made icing to draw sheepy faces onto the giant chocolate buttons. I used black nonpareils to give them pupils. 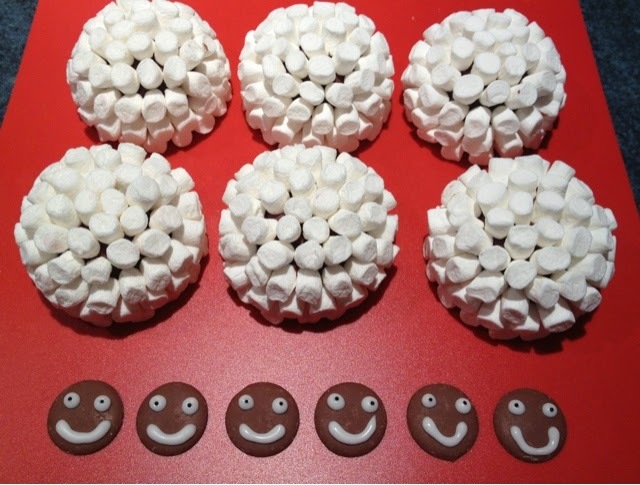 Attach the faces to the marshmallowed bodies with either chocolate or icing. Herd them back in the fridge to set. The Dandy Dons only went and won the cup! Not exactly their finest performance but with the score still 0-0 after extra time it all came down to penalties and when it counted they duly hit the back of the net. To celebrate we attempted to set the sheep on fire. Alas a wee bit of smouldering and charring was all that could be mustered. Perhaps we should have doused him in something alcoholic first. I reckon Foodie Loon will be pretty well doused at whatever time he rolls in. Plenty sair heids in the Granite city the morn. 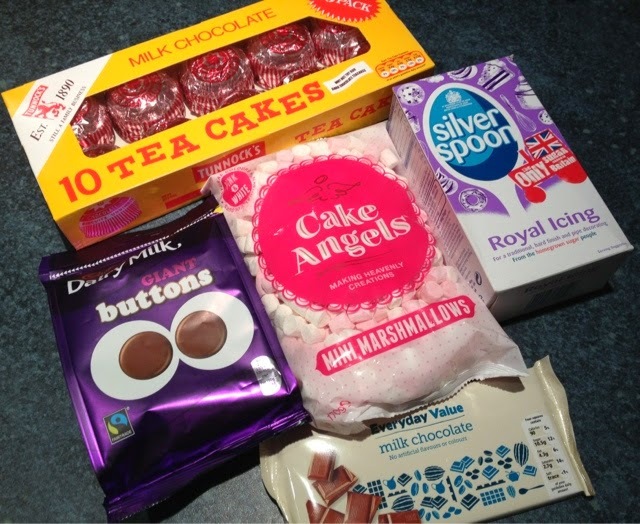 When the theme of the March Pinnies & Petticoats Cake Club was announced I must admit that my heart sank. All Natural Ingredients - No Processed Food. Doesn't really sit well with cakes and bakes in my book. I so haven't got into the whole clean eating paleo diet malarkey. I was stumbling around in the dark about what to make and then I had a lightbulb moment. 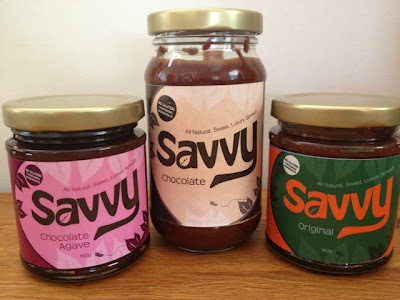 Savvy Spreads had sent me some of their product to try. 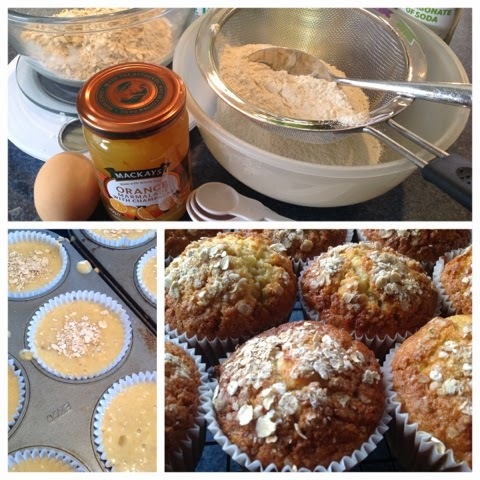 Made using 100% natural ingredients it could be the perfect base for my bake. I checked the labels and all seemed good. All natural, sweet, luxury spread. 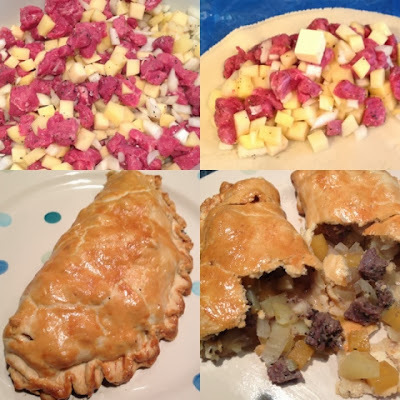 Suitable for vegetarians and no gluten containing ingredients. 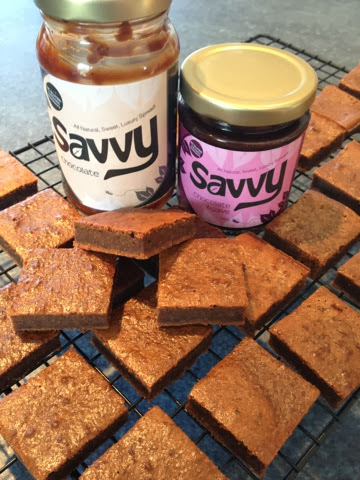 I really wasn't sure how it would work incorporated into a bake but reckoned that a savvy brownie could be a good option. Beat with an electric wisk, pour into a well greased tray bake tin and bake for 12 - 15 minutes at 160 degrees. 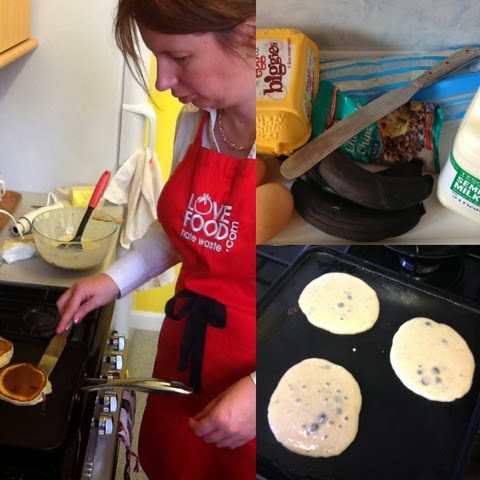 A new venue for Cake Club this month. Our previous home at Tiger Tiger shut its doors for the final time on 1st March. Amicus Apple made us very welcome in our new location in a swanky private room upstairs with our own bar and barman. 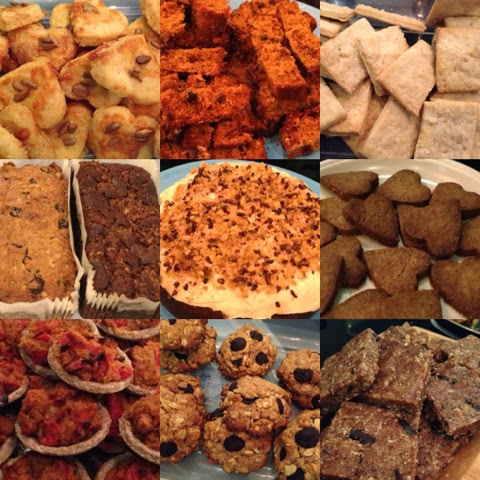 A great turnout of bakers and lovely to welcome some new faces. I wasn't the only one who struggled with this theme but everyone had made a valiant effort. 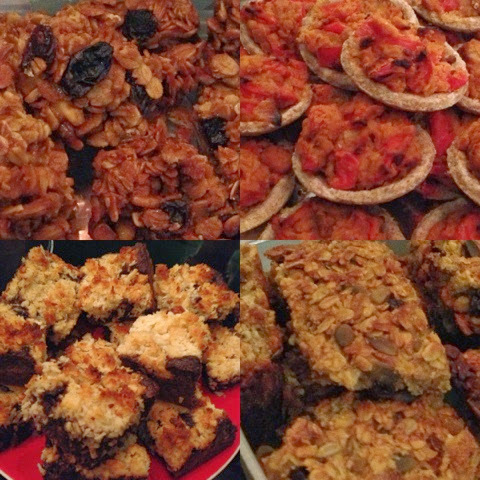 Plenty of nuts, oats, carob, coconut oil, agave syrup, seeds, honey, fruit and vegetables putting in an appearance. 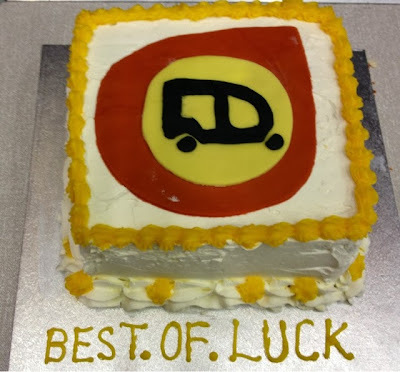 This was definitely the most challenging theme we have tackled at cake club. Gluten free was a walk in the park in comparison. Confession time. 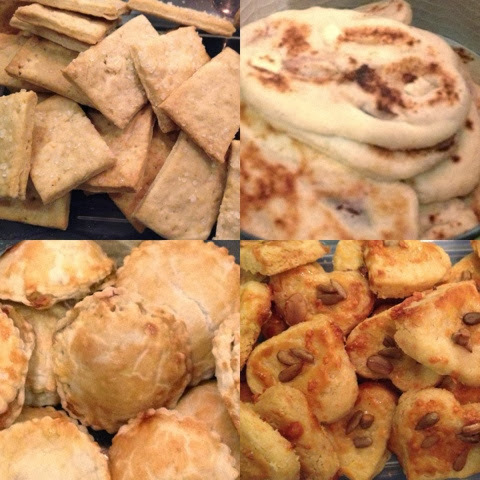 My three favourite bakes of the night were by far those who had strayed from the path and used refined white flour. 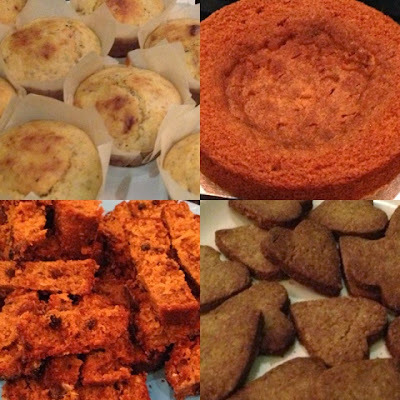 For me a cake, bake or biscuit is supposed to a treat and unfortunately all natural just didn't hit the spot for me. Next Pinnies & Petticoats meet is Wednesday 16th April, 7pm at Amicus Apple. The theme is Cocktails & Canapes. Much more up my street. I'll definitely be taking the bus to this one having seen the extensive Cocktail list at Amicus Apple. The penguins might even put in a guest appearance. "musicians, filmmakers, and artists have successfully raised funds and fostered awareness through crowdfunding"
I knew a wee bit about crowdfunding and a couple of projects had caught my eye on social media but I'd never actually taken the next step and put my hand in my pocket and got involved. This was about to change. 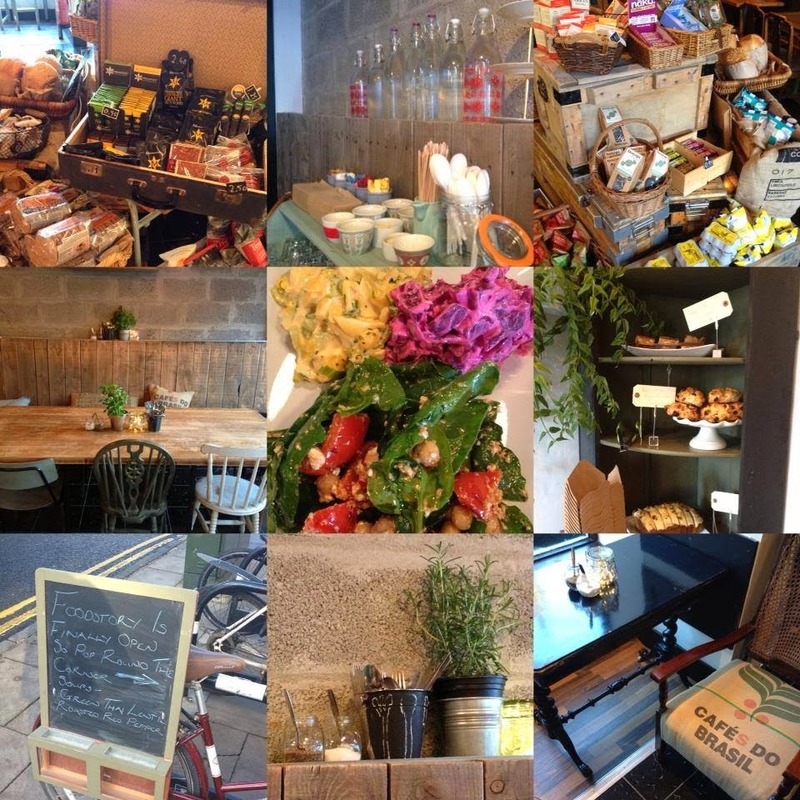 My first foodie investment was in Foodstory Cafe. Lara and Sandy's story and plea for funding for The Next Chapter really captured my imagination and their passion for the project and love of food shone through in their proposal. 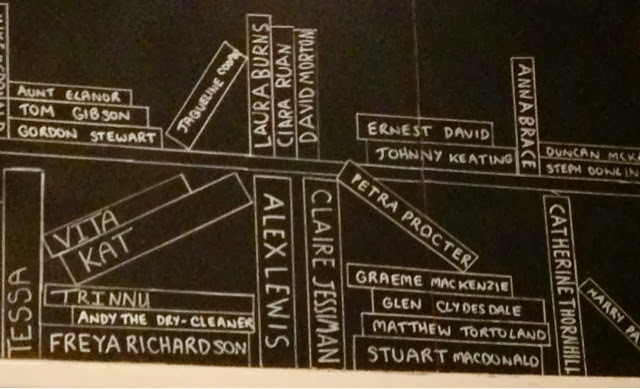 I tentitively dipped my toe into the crowdfunding water and pledged £10. Along with 139 other backers the £8,000 goal was reached and surpassed with a total £10,070 being pledged. I eagerly followed the process of the cafe build on the Foodstory Facebook Page which was not without its ups and downs and delays. By pure chance we managed to be some of the first people through the door when they opened on 11th November. Amazing decor, food and atmosphere. I've been back again since and there's always a warm welcome, great food and fantastic coffee. 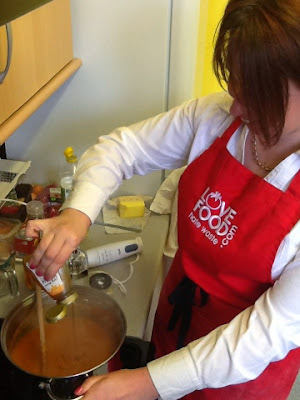 Its also the new home for the Aberdeen Gourmet Gals Food Swap. As a backer I got an invite to go along to the official opening event, a voucher for a gluten free brownie, Foodstory sticker, thank you via Facebook & Twitter, an emailed photo-montage of the shop and my name on the Foodstory thank you Chalkboard. Most importantly I also got a warm and fuzzy feeling inside for helping to support the project. My next deal was in Cheese. Regular readers of this blog will know that its a passion of mine so investing in it was really a no brainer. 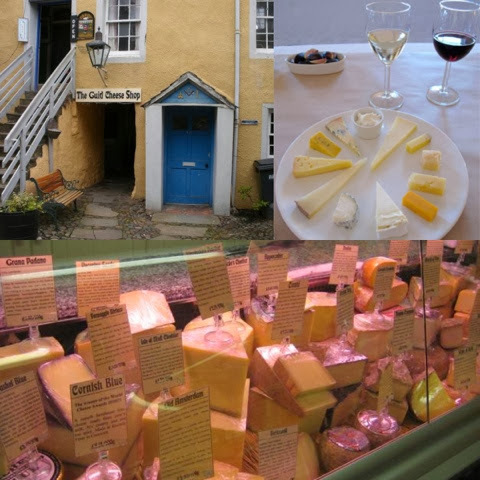 Caroline and Alex were aiming to raise £3,000 to Save The Guid Cheese Shop in St Andrews. I was getting a bit braver in my investments by this point so opted to pledge £25 with the reward of being officially thanked on the Guid Cheese Shop Website as well as appearing on the Wall of Fame in the shop, plus free entry to a Cheese Tasting event as a VIP or an Olive Wood Cheese Board. This project was touch and go right up to the last minute in terms of whether it would be 100% funded or not. The money you pledge only gets removed from your paypal account if the Crowdfunding is successful. I was anxious to insure that it went ahead and spent the final couple of days tweeting cheesy friends about the project and urging them to get onboard. At the eleventh hour 103% funding was reached by 105 backers. Goodness knows how the crowdfunders deal with what must be a really anxious time. I can only compare it to the final seconds of an ebay listing when you find out if you have won or if you've been gazumped at the last moment! The final investment opportunity that I've bought into is still active so you can take part too. 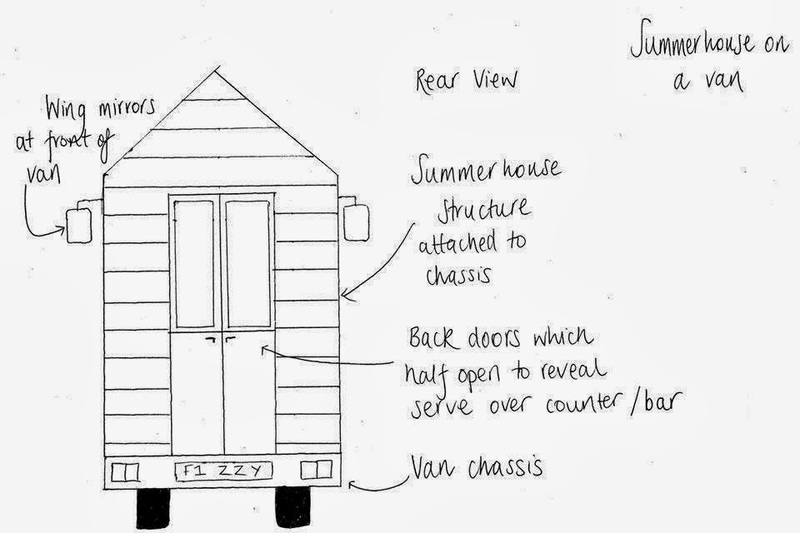 What's not to like about the prospect of being part of a Lemonade Summerhouse on Wheels? Claire at Berry Scrumptious in Aberdeenshire is expanding from chocolate strawberries and fruity confectionery into real lemonades under the Summerhouse Drinks branding. 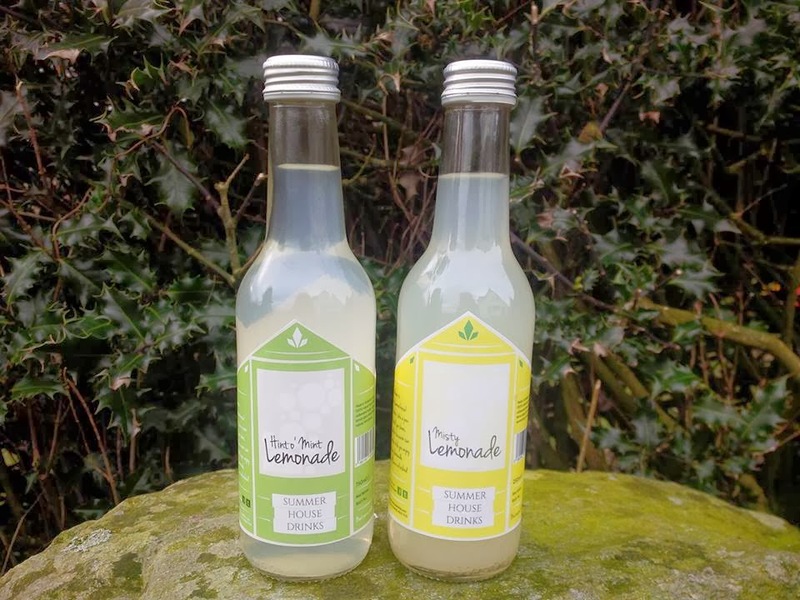 She needs your help to fund a Summerhouse on Wheels which will be used to take their new range of natural, Scottish lemonades to festivals, foodie events and exhibitions. I've got a £50 stake in this project and that will get me an invite to an exclusive VIP tasting event on the van's maiden voyage round Scotland. A case of 12 bottles of the first lemonade flavour and 15% discount for a year at the Berry Scrumptious website. I must admit being very tempted by the £250 reward to spend a day at Berry Scrumptious HQ learning the secrets of strawberry chocolate dipping and making truffles, fudge and toffee. The £750 exclusive use for a special event would be fantastic for a garden party. Have a look at their video and support if you can. Minimum pledge is only £10. That's the amazing thing about Crowdfunding. All the wee bits come togther to make a project happen. I'm proud to be a fizzy friend and can't wait to try their Hint o' Mint Lemonade with a sneaky gin. Lets get the totaliser pushed right to the top. Currently sitting at 76% funded with 122 backers and 13 days to go. Summerhouse Crowdfunding Campaign Video from Developing Perceptions on Vimeo. 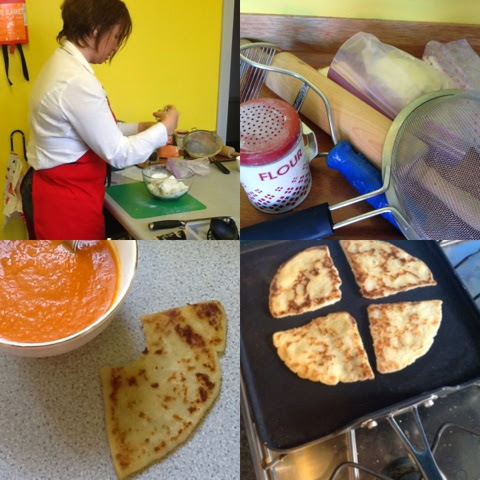 Are there any other Scottish foodie Crowdfunding campaigns on the go at the moment? Have you successfully invested in something foodie that gave you a warm fuzzy, cheesy or fizzy feeling? Preheat the oven to 160 degrees and grease a tray bake tin. 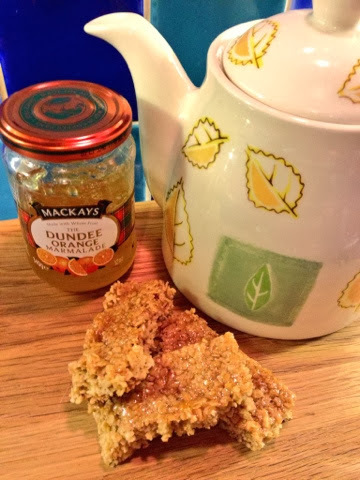 Melt together the butter, sugar, syrup and 100g of marmalade over a low heat in a good sized pan. Stir in the oats, cinnamon, baking powder and salt and mix until well combined. Tip into the prepared tin and smooth with the back of a metal spoon. Bake for 20 minutes or until the edges are just beginning to turn golden. Melt the remaining 50g of marmalade and paint it over the top with a pastry brush. Cut into bars whilst still warm, but don't attempt to remove until completely cool. 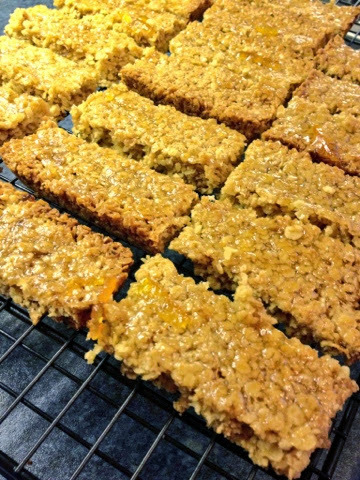 Really pleased with these flapjacks. Super easy to make,lovely and tangy and very moreish. Caused quite a stir when I posted a photo of them on twitter asking if anyone fancied one. 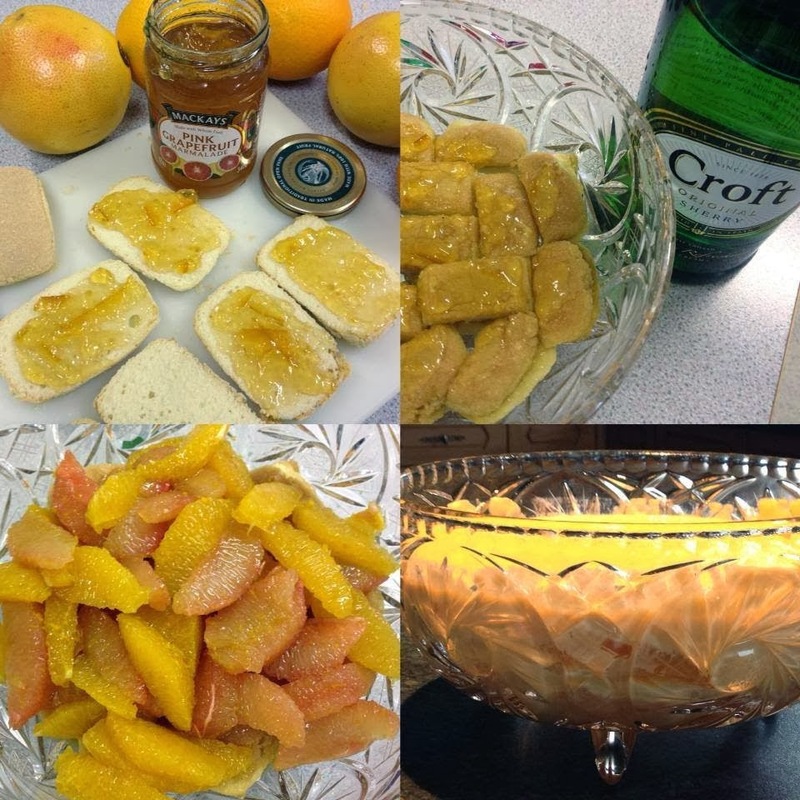 Whilst we're in a marmalade mood I though I'd share some of my other recipes utilising it. 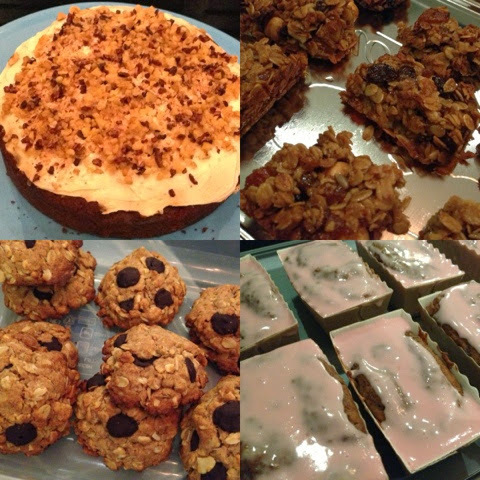 Another bake, a savoury dish and a desert. It's nothing if not versatile as an ingredient. Click through to the original blog posts for the recipes. Just so the other events of this week don't feel in the shade of marmalade I also made Pancake Pops for Shrove Tuesday and Cornish Pasties for St Pirans Day. Haven't managed to squeeze in a pie yet but there's still the weekend. Thanks as always to Mackays for sending me a selection of their artisan preserves to work with. 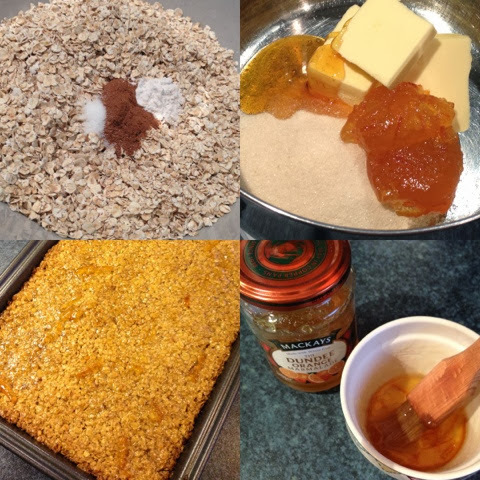 There's certainly more that can be done with marmalade than just spreading it on your toast. I try to keep my ear to the ground about foodie events happening in the area. Nothing worse than only hearing about something after its happened. I was delighted to spot a piece about an Asian Food Festival on the STV Aberdeen App and got in touch with organiser Aakanksha to find a wee bit more about it. 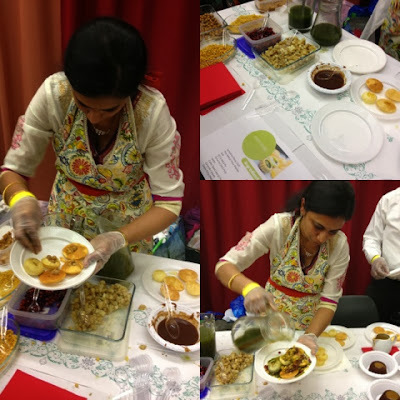 She explained that she was holding the festival to support her upcoming challenge of Tuk-Tuking her way around India fundraising for Alzheimers Society and Breast Cancer Care. I Googled the street foods of "Vada Pav" from the west and "Medhu-Vada" from the South both of which Aakanksha recommended and decided we'd definitely head along. Hopefully I also managed to encourage a few more folk to attend as I shared the details on my Facebook page and Twitter and with the Aberdeen Food & Drink Lovers Meetup Group. We arrived just before 5pm and the Ferryhill Community Center was jam packed with people and there was an absolutely wonderful aroma. A wristband at the door meant you could come and go as you pleased and a food voucher system was in use so the stall holders weren't handling cash. 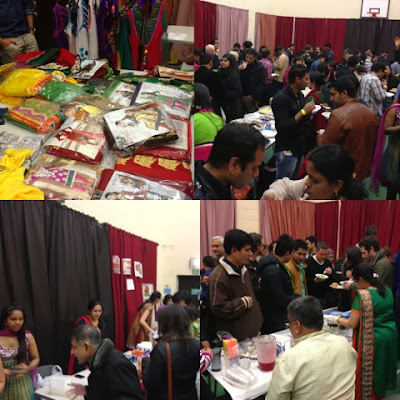 We wandered round having a good look at all the stalls, taking in the buzzing atmosphere and meeting organiser Aakanksha before we had our first taste of Asia. 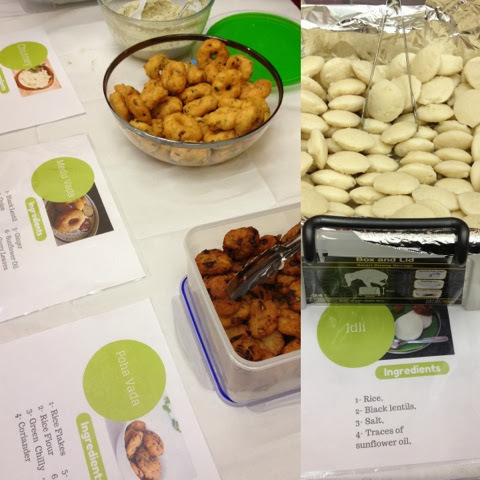 All the stalls had very clear details of what they were selling with a list of ingredients. Really useful when we didn't have a clue what many of the dishes were. The stallholders were so friendly and enthusiastic about their homecooked food and were more than happy to answer questions and advise what was a wee bit on the spicy side and what might blow your head off. 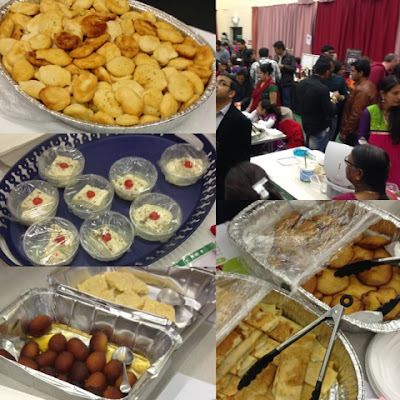 Idli, Medu Vada and Poha Vada were on our first plateful along with a chutney. The Idli were a plain steamed rice dumpling. Very dense in texture and not much flavour. They didn't really do it for me. 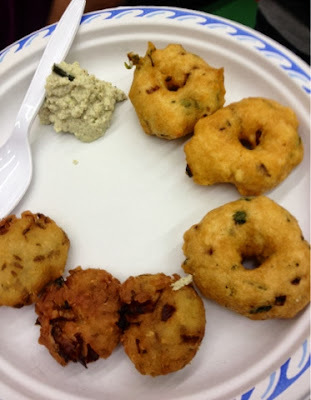 The donut shaped Medu Vada were fantastic. I can see why this is a popular street food in the South. The Poha Vada were equally good. We returned for a second plateful of both. Next another of Aakanksha's recommendations. 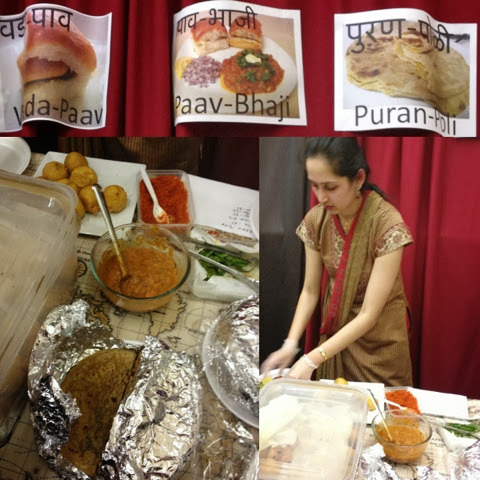 There was a huge queue at this stall and their three dishes of Puran Poli, Paav Bhaji and Wada Pav were going like the proverbial hot cakes. 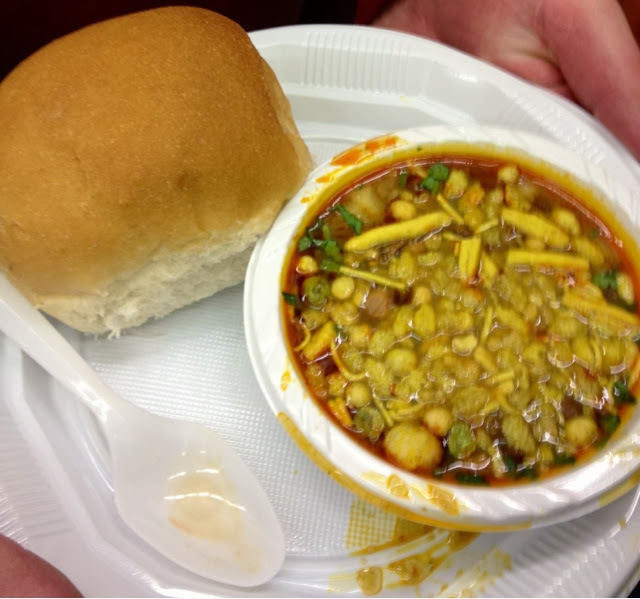 Absolutely loved the Wada Pav. 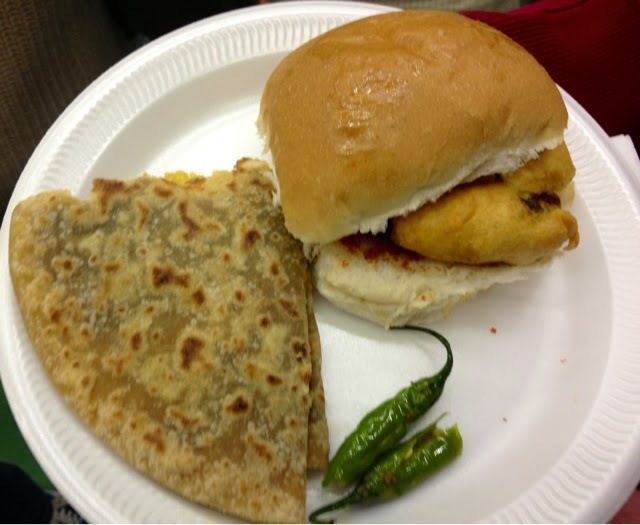 The Indian version of a burger. A battered spiced potato patty served in a bun. I was intrigued as to why the top of the bun was also spread with butter. I made the mistake of assuming that the Puran Poli was a savoury flatbread. Its sweeteness may have been why I was asked if I wanted it on a separate plate. It tasted amazing. Like a thin Peswari Nann. Boy was very excited to spot Pani Puri. He duly explained that he'd watched Kirstie Allsopp make it on Jamie & Jimmy's Friday Night Feast. Needless to say he was desperate to try it. 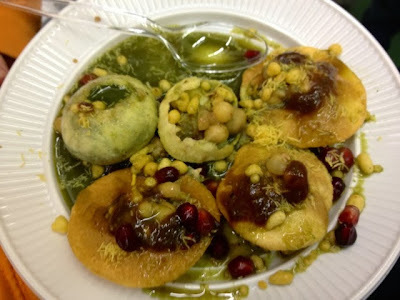 Deep fried puffed up pastry discs formed pouches for a variety of fillings including the spicy flavoured water or Puri. Pani=bread, Puri=Water. These were amazing. A real taste and texture explosion in the mouth. Whilst queuing for our Pani Puri we got chatting to the adjacent stallholder and promised to come back and try their Misal Pav. Another amazingly good dish consisting of a curry of sprouted lentils topped with what I would describe as bombay mix. Fantastic texture and a real kick of flavour. We washed it down with a bright pink glass of super sweet Rooh Afza Lassi. Whilst three of us were more than happy to tuck into the selection of Indian food on offer it wasn't exactly girl's thing. However she was delighted to track down some western food and thoroughly enjoyed her Macaroni Cheese, Mango Juice and Sticky Toffee Pudding. 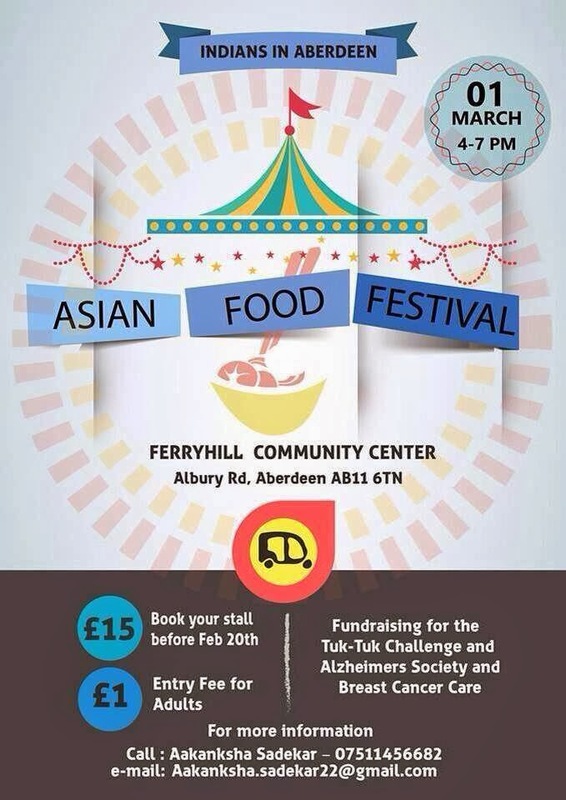 A fantastically well organised festival bringing a real taste of Indian street food to Aberdeen. I really hope this will become a regular event. Over 500 people through the doors and £700 raised. Follow Aakanksha's crazy adventure through India on a glorified lawnmower on the Rickshaw Chronicles.